Dubai Harbour will be the first cruise destination in the world to build two terminals simultaneously, it has been has revealed. When completed, the two terminals will accommodate 1,200,000 passengers annually, the company announced at the recent Cityscape Global 2017, which was staged in Dubai from 12-13 September. The addition of a second terminal is intended to build on Dubai’s reputation as a leading tourism destination, while capitalising on strong growth in the cruise industry globally. Industry data suggests that more than 40 million people will cruise annually by 2030, up 40 percent from 24 million in 2017. His Excellency Abdulla Al Habbai, group chairman at developer Meraas, said: “Dubai Harbour connects some of Dubai’s most vibrant neighbourhoods and reflects a culture of innovation envisioned by His Highness Sheikh Mohammed bin Rashid Al Maktoum, Vice President and Prime Minister of the UAE and Ruler of Dubai, for the emirate. The project also reaffirms our commitment to expanding on Dubai’s rich maritime heritage and tourism profile, while supporting the continued diversification of the national economy. Each terminal will be approximately 14,000 square metres in size with one single apron of 900-metres. While other ports have multiple terminals, none have so far built more than one at any given time. In addition to serving the cruise ship industry, Dubai Harbour will feature the largest marina in the MENA region, which once complete, will have 1,100-berths capable of accommodating some of the world’s biggest private yachts. 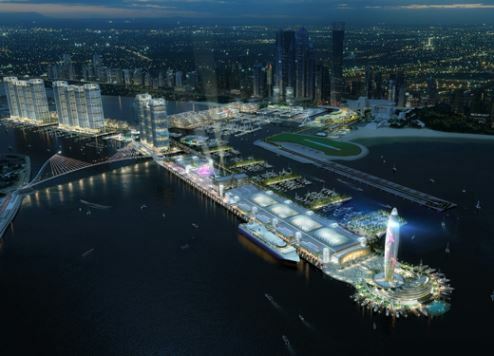 Dubai Harbour was officially unveiled by Sheikh Mohammed in January 2017 and will include a shopping mall, an events arena, restaurants, cafes, hotels and a yacht club. It will also feature the Dubai Lighthouse, an architectural marvel stretching 135 metres into the sky with an observation deck offering stunning panoramic views.